Can we change our minds about change? Let’s get something out the way: yes, there are some changes that are horrible. It’s hard to say to someone that there’s a bright side to living in a war-zone, or to becoming homeless, or to a loved one unexpectedly dying. We’re not going to sugar coat it for you or tell you things like “every cloud has a silver lining.” Some don’t. Most change that happens to you – and there is so much more change than you may realize – is probably for the better. The positive far outweighs the negative when you look at all of the change you are confronted with day after day, month after month, year after year…..
“I hate change,” said most people at some point in their lives. Let’s test that statement. Sounds like a bleak existence, but yet all of those events are changes – they’re just changes that we label “good.” When we make a friend, we’re happy that we made a friend. When we lose a friend, we’re usually upset about the change to our lives. Why do we think we hate change? Because we’re comfortable with what we know (even if something better lies ahead). 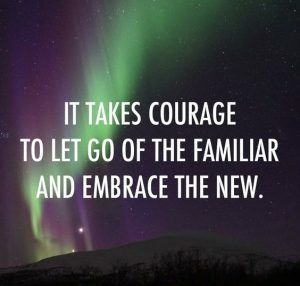 That comfort means we start fearing change because change is inherently uncomfortable. But, look at how uncomfortable not changing can ultimately be! Which do you want first, the good news or the bad? If you start with that assumption that all change is bad, you risk only seeing the bad in change. It’s as if change is guilty until proven innocent! But, what if you were to allow yourself a moment to turn that initial negative reaction into a search for the good that will come out of change? You find out that you are in for a few months of traffic problems because of construction. You may have to take a different route or leave earlier to ensure you get to work on time. For months! However, when it’s all done, there is going to be an additional lane in both directions, and those deep potholes that you’ve been driving over for years will finally be fixed. The end result promises to be a faster commute to work for years to come. The short-term change was a total bummer, no question about it. But, the long-term change will be for the better. Is it so hard to see how that same thinking can be applied to almost any change? Give it a try: the next time you get mad about a change, see how quickly you can find the good in it. We know, it sounds trite. But, a good saying is a good saying. However you want to say it, the point is that if you occasionally remind yourself that things will change, you will find it easier to react when it does. How do you train yourself to expect the unexpected? Start with really small things, you’ll find it becomes easier with the bigger things as time goes on. Expect that one day you might drop your favorite mug and have to use a different one. Expect that one day your local diner might change its coffee. Expect that your car will one day need to be replaced. Expect that your (completely quiet) neighbors may someday move away and will be replaced by new neighbors. You can look at that list as being really pessimistic. Even fatalistic. But, we’re not saying you shouldn’t enjoy what you’ve got. On the contrary: the very fact that things will change is a call to action to enjoy what you have right now!! Do you treat change as guilty until proven innocent? Give us an example by leaving us a voicemail at 646-653-9278 or sending us a message here.